This week we’re going to talk about an [article] that’s so new, it doesn’t even have page numbers yet. The purpose of this study was to find out why a population of mammoths on the island of Saint Paul, Alaska went extinct. But first, let’s talk about mammoths. Mammoths were large elephants that were covered in thick fur. They are most closely related to Asian elephants. Mammoths had teeth adapted to grinding, similar to modern horses, for eating grass and other plants. The last mammoths went extinct about 4000 years ago (that’s 2000 BCE). To put that in perspective, the earliest Egyptian pyramids were built around 2600 BCE. The Egyptians were building pyramids while the last mammoths were still roaming the tundra. Let that sink in for a minute. 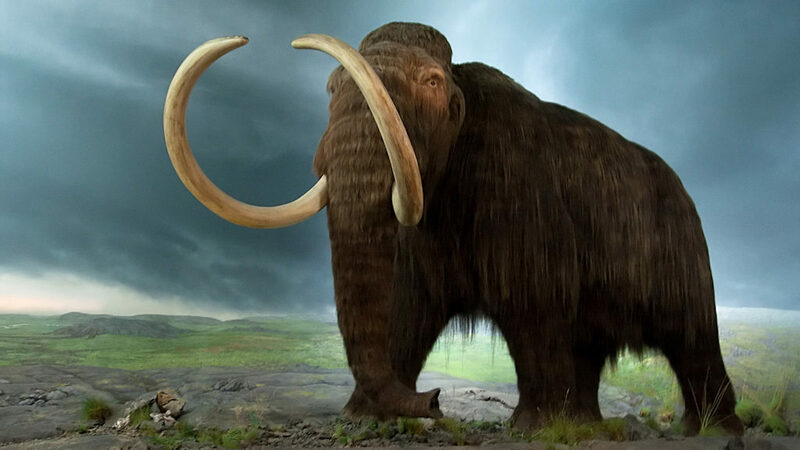 An artist rendition of a mammoth (from PBS). The authors of this study traveled to Saint Paul, Alaska: a tiny island that’s over 450 km (280 miles) away from Alaska and the Aleutian Islands. 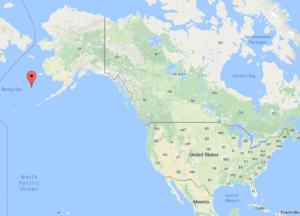 A map showing the location of Saint Paul Island, Alaska (the red marker) (from Google). They took sediment core samples from the deepest lake on the island, Lake Hill. What’s a sediment core, you might ask? A sediment core is a sample of sediment or dirt that is gathered by drilling a deep hole. As the drill comes back up it is filled with a sample, or core, of the sediment from that spot. Because sediment is deposited in layers over time, these cores contain information about what the conditions were like in that place over time. 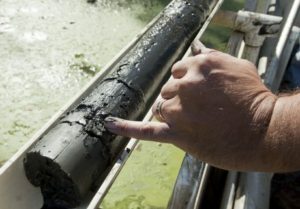 A photo of a sediment core from a lake (photo by N. Krug). The authors tested the cores for the presence of DNA and three fungal spores. The fungi they tested for are types that eat animal poop, so their presence in the cores will tell us that there were animals in that spot. The authors also tested the cores for plants, tiny invertebrates, pollen, and isotopes (chemicals that tell us about the environment) to understand how the environment was changing over the last 10,000 years. The ice melting at the end of the Ice Age was raising sea level and causing Saint Paul island to shrink. Fresh water on the island was disappearing because the rising sea level invaded ground water and lakes. Mammoth activity around the lake destroyed the plants around the lake and caused more sediment to fall in to the water, filling the lake with sediment and causing the lake to disappear faster. These mammoths probably died of thirst around 5600 years ago. These conclusions bring up a point that we all need to pay attention to: as sea level rises, the amount of freshwater on islands will drop. That means many of the Pacific Island nations, among others, are immediately in danger from sea level rise, not only from shrinking space, but also from losing freshwater sources. As sea level continues to rise, we will have many concerns about resources and population. Those who say global climate change is a myth are choosing to ignore a global problem that is already affecting us. Studying extinct animals, like this Mammoth population on Saint Paul Island, can help us understand how climate change will affect us in the years to come.